Today we finally put away our holiday decorations. I know, I know, the holidays were nearly two months ago. It's not that I'm lazy, I just didn't feel like it. And while I don't make New Year's resolutions, I have recently decided to do things for me and to live on my watch. What I mean by that is to do things when I'm ready rather than to do them just because public opinion says when to. If there are other events that mean more to me, than by golly I'm going to do that first. And finally today I was ready to clean up, it didn't hurt that it was 5 degree outside and I had no intention of leaving the house! So what to cook when you have a full day of putting away decorations and cleaning, and it's another single digit weather day in Chicago? Crock pot stew. Hearty, simple, healthy and easy cleanup. 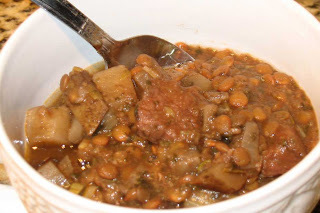 Take one crock-pot and add 2 cups of stew meat (cubed), 1/2 chopped red onion, 2 stalks chopped celery with leafy tops, 1 russet potato, cubed, 1 jalepeno- chopped with seeds, 1 cup dried lentils, 2 tablespoons of tomato paste, 2 cups of red wine, 1 tsp garlic powder, 1 tbls dried thyme, 1 tsp dried rosemary, 1 tbls parsley, crushed, black pepper, salt and 1 beef boullion cube. Add water to cover all the ingredients. Cover and turn the crock pot on high for 3 - 4 hours or more. Remove the cover the last 1/2 hour to allow to naturally thicken. Serve in a big bowl, top with fresh parsley. This is a great filler after a long hard day of housecleaning, and the jalepeno will warm the cockles. As always, remember to adjust the seasonings and spices according to your tastes. You may find one whole jalepeno too spicy, so feel free to cut back on it or leave the inside seeds out. No matter how you tweak it, enjoy it and be fat and happy!